I would venture that anyone who has an acrylic reef tank, especially a large deep one, has problems keeping algae, particularly coralline algae, off the viewing pane or panes. Coralline algae grows on glass also, perhaps not as readily, but it is relatively easy to scrape off with a variety of sharp metal blades. And, there are some manufacturers that provide attachments to cleaning magnets so that the aquarist doesn’t have to put his or her hands into the tank. A particularly effective one is manufactured by Ocean Motions. However, when it comes to an acrylic tank, no matter how careful one is with a metal blade it will scratch the tank. Currently, I have been experimenting with using plastic blades in one of these magnetic devices – so far, with only moderate success. 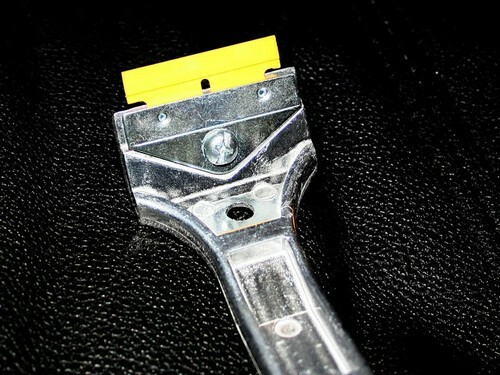 If you are interested in working with one of these plastic blades, you will find a number of manufactures that make them, and of different hardnesses. 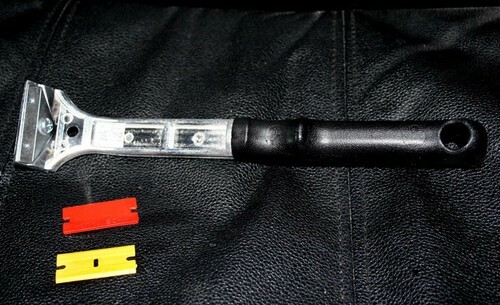 Pictured are some of the blades I have been experimenting with, along with an aluminum paint scrapper that holds them. So far this works, but requires that you put your hand and arm into the tank. The plastic scrappers made by Kent work also, but in my opinion not as well. Paul, at Ocean Motions, is working on a new magnetic one for acrylic, but it is not available yet. No matter how careful you are it is hard not to scratch acrylic. So, when I was sent a kit for removing scratches from acrylic, even underwater, I agreed to review it. I will do so when I can find some time. If someone cannot wait the kit is manufactured by Everclear, Transparency Refurbishing. www.etr-inc.com, phone number 512-301-7562. They provide a variety of products developed for acrylic aquariums, and will even send a team to your home or business to remove scratches from inside or outside your aquarium.